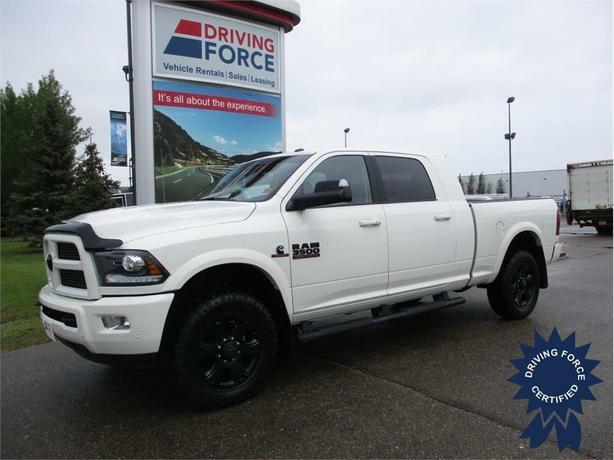 This 2017 Ram 3500 Laramie Mega Cab 5 Passenger 4X4 6.3-Foot Medium Box Truck has a 160.5-inch wheelbase, 6-speed automatic transmission, 3.42 rear axle ratio, leather seats, 220-amp alternator, 5th wheel/gooseneck towing prep group, transfer case skid plate shield, spray-in bed-liner, black tubular side steps, centre high-mount stop lamp with camera, keyless enter and go with push start, front and rear all-weather floor mats, remote start system, power adjustable pedals with memory, electronic transfer case, electronically controlled throttle, HD shock absorbers, front anti-roll bar, hydraulic power-assist steering, auto locking hubs, 10 Alpine speakers, media hub with USB and aux input jack, front heated seats, sentry key engine immobilizer, perimeter alarm, three 12V DC power outlets, tire specific low tire pressure warning system, 117.3-litre fuel tank, 4,250 lbs Maximum Payload, and GVWR rating of 12,300 lbs (5,579 kgs). The 6.7-litre Cummins I-6 Turbodiesel engine provides 370 horsepower at 2800 RPM and 800 lb-ft of torque at 1600 RPM. Touch base with us using our handy web form and one of our heavy-duty truck sales consultants will assist you with any questions you may have.